Cláudia Pascoal will represent Portugal on homefield. The victory followed a drama leading to favourite Diogo Piçarra’s withdrawal, which blew the competition right open. Eurovision Song Contest’s host country – Portugal – has now decided which act and song will represent the country at home. The decision was up to a national jury and to the public at home that has been voting since last Monday, the 26th of February. While everything usually goes smooth with the show, the 52nd edition of Festival da Canção suffered a few changes throughout this past week mostly due to controversy. A day after Diogo Piçarra’s victory in the show’s second semi final, the singer was accused of plagiarism and ended up quitting the competition. His decision of leaving the show, opened the doors for a new finalist – Susana Travassos – and, of course, for hard to predict results. 14 songs were performed but at the end, Cláudia Pascoal was crowned as the winner. As Portugal won last year’s event, O Jardim has already guaranteed a ticket for the Eurovision’s Grand Finale. Both the first and the second semi finals had an obvious distinction between men and women as the first one was hosted only by men and the second solely by women. The final show, nonetheless, was hosted both by a man and by a woman. 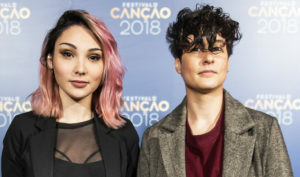 Pedro Fernandes and Filomena Cautela – one of this year’s Eurovision presenters – were the faces of Festival da Canção’s final show and as expected there were a lot of jokes throughout the entire show as they both come from comedy. In fact, the beginning of the show was a comedy act from the two hosts. EBU’s executive producer Jon Ola Sand was present in the show and stepped in for a small conversation where he played along with Filomena’s and Pedro’s jokes. For the first time ever, Festival da Canção’s Grand Finale was held in Guimarães in Pavilhão Multiusos. The show’s stage was an obvious homage to what’s yet to come in Altice Arena – where Eurovision will be held in May. During the show there was time for an homage to the iconic Doce, Portugal’s 1982 representatives, in form of a medley of their biggest hits. An homage was also made to Simone de Oliveira (Portugal, 1969) by huge names in current Portuguese music such as Aurea, Marisa Liz and, unexpectedly, herself who received a long standing ovation. Before the voting was revealed, Luísa Sobral took the stage to perform her brand new song. On the other hand, before the public vote – the final one – was revealed Amar Pelos Dois was remembered quickly. Rui David wasn’t supposed to be singing tonight but here he is due to RTP’s error of communication announced the day after the show’s first semi final that ended up eliminating Eu Te Amo and bringing back Sem Medo. It isn’t something new. In fact, Sem Medo truly follows what one could expect from a Jazz song and there’s nothing wrong with it as it is a simple yet very romantic production where Rui sings to a woman that is no longer with him physically but very present in his thoughts. It feels good and it feels right. Could Portugal be represented by a Jazz song and artist once more? Based on tonight’s performance that will be difficult as Rui was clearly lost in such a big stage and off key at times. Isn’t this curious. The second performed song wasn’t also supposed to be performed tonight and only qualified after Diogo Piçarra withdrew from the competition but here it is. Mensageira is a slow song, yet not a ballad. Its rhythm could make it fit within the Jazz genre. As for its lyrics, it is a poem to someone that Susana is not willing to let go as that person truly treats her well and loves her unconditionally but will eventually leave. In a red dress, Susana kept her performance equally simple. It may be a rough night for her as during the show’s second semi final she scored 0 points from the public. It is the only English song to make it through the finals and its qualification was only thanks to the public that awarded him the third best place unlike the judges who only gave him one point. Peter Serrado traveled all the way from Canada to Lisbon to sing at this year’s Festival da Canção. With him, he brought only a guitar and a nice sing-along Pop Acoustic song that can easily remind one of Canadian popstar, Shawn Mendes – also with a Portuguese background. Sunset is romantic summer song that would obviously work as a radio single. Peter certainly has the public to back him up but will the judges be less bias this time around? This fun Pop song contains all the elements to be successful yet during her first semi final performance, Joana appeared to be nervous, off key and a little uncomfortable on stage. She barely made the cut and was only saved thanks to the judges. During this week, many compared Zero a Zero to Portugal’s 1989 song – Conquistador – and it does share similarities with Sara Tavares’ Solta-se O Beijo in its chorus. This week ended up not benefitting Joana again as the stage’s size hurt her stage presence even more. Besides the obvious favorites, Lili built the strongest fanbase out of the show’s second semi final as O Voo das Cegonhas came out as something completely different and unique. Not only in Festival da Canção but even in Portugal’s music industry. The song’s main inspiration was based on a legend of a fishman that could fit this year’s Eurovision motto. Besides the interesting and out of the box lyricism, the tune features a quite underground production unforeseen in the competition. This week, Lili was as consistent vocally and surely improved her look on stage with a better dress, hairdo and makeup. On the negative side were the moments Lili was ahead of the song’s tempo. Everything about Catarina’s entry is a breath of fresh air… From the looks to the way she sings to the lyrics. Para Sorrir Eu Não Preciso de Nada is a ballad that runs away from its traditional formula. On top of that, it is a love song dedicated to not a man but to a woman as she finishes saying “ela é minha namorada” (she is my girlfriend). YouTube comments compare her to Bjork and even to someone that could be featured in a Tim Burton movie: “Careful! Don’t let this girl go to Eurovision or we’ll have to spend extra 20 million euros next year”, one person said. Catarina was one of the stars of the show’s first semi finals as she scored big points both from the judges and from the public. Just like many of the previous performers, Catarina had a few weaker moments being off key. We have yet another ballad that even got the honour of being covered by Salvador Sobral. Along with its sad tone, Anda Estragar-me os Planos also shares sad lyrics. Joana sings about the need of having someone “ruining her plans” as her life has gotten boring throughout the years. Her first semi final performance was quite simple as it featured no band behind her or even back vocalists on stage. The performance had no changes from the semi final’s which could’ve been in her best interests as her outfit isn’t exactly what one would expect for an event like Festival da Canção or Eurovision. It is hard to characterize both the song and the performance as there’s not really any highlights. David Pessoa’s performance and song are quite humble, in fact. In a suit, David stays in the same place throughout the entire performance while he sings about being in love. It is a song that could potentially work for Portuguese radio or as a theme song for a telenovela but it’s hard to see it as an Eurovision entry. Nonetheless, it received points from the jury and from the public during the second semi final. One shall see if that will happen again tonight. This needs to be one of the most unexpected entries at this year’s Festival da Canção. The African music influences are notable right from the beginning of the song. In a competition filled with slow and sad songs, Minnie & Rhayra’s song comes off as such an unique piece of music. Besides breaking patterns sonically, it also features 11 different languages in its lyrics. One will find it hard not to move or even smile while listening to this song. Whether one hates it or loves it, a thing we know for sure: happiness is contagious. The resemblances to Salvador Sobral’s performance and song last year are inevitable. In fact, Janeiro is, not only, a close friend of Salvador but he was also last year’s winner choice of composer to take part in this year’s Festival da Canção. The similarities, nonetheless, come as Janeiro also chose to go with a slow and minimalistic song and performance. Joined solely by his electric guitar, Janeiro sings about love where he contemplates the person he is with. In his song, Janeiro talks about how time lacks and how he will never stop loving the person he is with. Similarly to Amar Pelos Dois, the singer is completely devoted to his loved one. Similarly to his first semi final performance, Janeiro kept it simple and extremely minimalistic. Sonically, Bandeira Azul is a song clearly inspired by Bossa Nova – a very popular sound in Brazil – which could make one think it wouldn’t be appropriate to represent Portugal in Eurovision. Nonetheless, when it comes to Maria’s vocals there is literally no doubts it’d be capable of handling the big Eurovision stage as she nails it every time. Despite the fact that it is a love song, its lyrics were created in order to compare the man she loves to a country hence why the song’s title is called blue flag (in English). She represented Portugal back in 1993 with A Cidade and, despite announcing last year she’d quite music for good, Anabela also claimed the offer was unrefusable. With this being said, she teamed up with Fernando Tordo and delivered a fun song that, sadly, got a low score from the judges. Amongst all songs, Pra te dar Abrigo may be the most Portuguese song of them all besides Peu Madureira’s fado entry as it features traditional elements such as the accordion. In the song, Anabela shouts out (literally) her love to her man and leaves no doubts that love is real. By the end, Anabela got extremely emotioned and was highly applauded by the audience. It is a quite gloomy production and it doesn’t come off unexpectedly. O Jardim discusses death and is a song dedicated to someone who is no longer with Isaura – the song’s composer. If you add that sensitive feeling – that everyone has felt – to Cláudia’s phenomenal delivery to the song, you have a potential winner. In fact, if we now stop considering Diogo Piçarra’s entry from the show’s second semi final, then Cláudia Pascoal was the real winner of the round. Amongst Eurovision fans, O Jardim is the favorite… Just check its YouTube comments. The performance was obviously the most applauded song of the night. He was the winner of Festival da Canção’s first semi final getting the 12 points from the public. Só Por Ela is also another very Portuguese song as it goes by Fado’s influences in form of a ballad. The song discusses the end of a relationship in a very heartbreaking way and one can indeed feel all the emotion Peu puts into his song hence why he was so well received by everyone. At the end of the day, Só Por Ela would be a nice add to this year’s Eurovision lineup as it would for sure feature one of Portugal’s better know genres. This time there was no jury in the studio evaluating the entries. Instead, a panel of national judges had 50% of the power in their hands. Those came from seven different parts of Portugal: North, Center, Lisbon, Alentejo, Algarve, Madeira and Azores. The remaining 50% was given to the public who had been voting all week. In case of a tie, the public vote would prevail hence why Cláudia Pascoal ended up winning. This will be Portugal’s first time hosting the Eurovision Song Contest as last year it was also the first time the country won the competition with Salvador Sobral’s Amar Pelos Dois. The organisation for the event has been highly complimented by EBU and seems to be going flawlessly. Despite the negative comments from the fans in regards to the method of selling tickets for the show, Portugal has been an example when it comes to getting things done.